The painter did the game's character in oils. The end result would not look out of place in a bookish study. And look at that Tali'Zorah—wow! 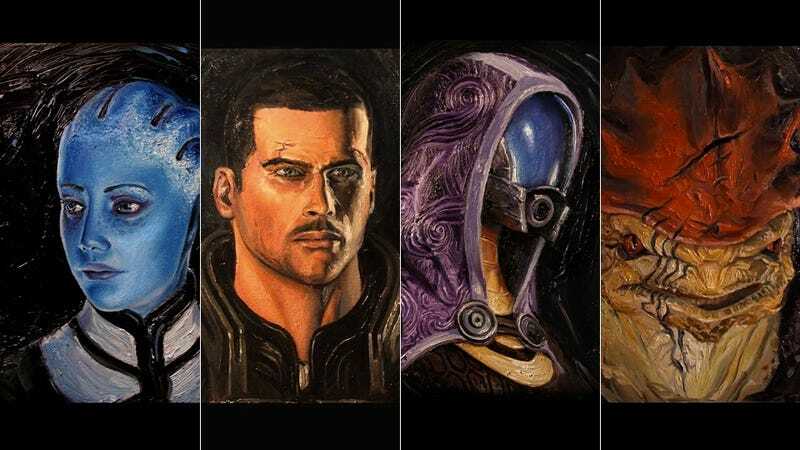 If you think the portraits are impressive (by damn, they are), check out Donaldson's Mass Effect speedpaintings. Previously, Donaldson worked on Dead Space Extraction and Goldeneye 007 for the Wii, among other titles. According to his official site (likewise, check it out), "Sean is still working hard as part of a concept group in Derbyshire aiming to create the best visual flair for a game yet." To view the images at full size, click the expand icon.